Whether your tired of the oem look, replacing a broken set of Headlights or building a show stopper monster, Spyder Auto has the Head lights guaranteed to break necks for your 2009 to 2011 Hyundai Genesis Coupe Part number: PRO-YD-HYGEN09-DRL-BK by Spyder Auto has the aggressive styling and OEM fit. 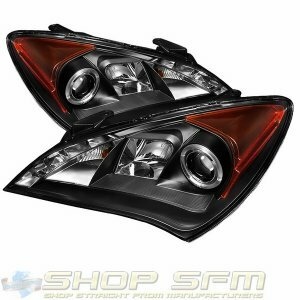 One if the easiest ways to Change the front end of your vehicle radically is with a set of Spyder Auto headlights for your Genesis Coupe. These head lights for most applications require no modification whatsoever and will mount up and connect to your vehicle. Spyder makes a wide range of styles which may include: angel eyes, audi style led strips, projector lamps, led styling and mulitple color options for each style. Spyder Headlights are fully weather sealed to prevent condensation and are DOT approved. If you find any Spyder Auto part cheaper than what is advertised, please contact us and we will do our best to match or beat any competitors price.